Owen’s life brought me a lot a of joy. Carrying him and fretting over him was stressful and heartbreaking, but it also taught me a lot about mother/parenthood, and I know that I am a better person for having grown him, birthed him, and loved(ing) him. However (and it’s a big however), being pregnant with a baby with multiple fetal anomalies (a phrase I hate but can’t escape from) is hands-down the most physically and emotionally taxing thing I’ve ever done in my life. I think the emotional heartache is obvious at this point, but the physical difficulty is something I wasn’t prepared for. I had polyhydramnios that gradually increased from my second trimester and reached it’s peak about 3 weeks before I delivered. My belly consistently measured about 3-5 weeks ahead of how far along I actually was throughout the second trimester. Then, at 30 weeks, I measured full term. I asked my midwives if we could just stop measuring at that point. I don’t know what I measured at 36 weeks, which was peak polyhdramnios time, and I don’t want to know. Extra fluid is consistent with an asphyxiating form of skeletal dysplasia (the chest is too small to allow the baby to process amniotic fluid), so every time I heard how far ahead I measured, all I could think about was Owen’s tiny chest and his inability to swallow fluid and how likely it was with each increasing centimeter that he was going to die. Polyhydramnios can bring on a bunch of uncomfortable symptoms that make life in general pretty unpleasant. I was quite short of breath, which can happen in later pregnancy anyway but seemed compounded by my high fluid levels, and I often felt like I just couldn’t breathe very deeply or get enough air. I had AWFUL pain in my ribs. AWFUL. Sometimes Zach would find me on all fours on the floor because it was the only position that really brought any relief. My belly got all stretched out and shiny. Obviously, all pregnant bellies stretch, but my belly was pretty crazy at the end. At 30 weeks, I had no stretch marks, and then my belly had about 4 weeks worth of growth in 1 1/2. Bam. Stretch marks. My shiny, stretchy belly also got pretty itchy, and I didn’t find any relief from that until 2 weeks postpartum. The irony is that I was dreading stretch marks from the beginning of pregnancy, but when I got them I was relieved. Even though Owen died, my body will always carry the physical evidence of him. All that is to say this: Owen’s pregnancy made my body and emotions a wreck. Beyond losing him, which is its own grief, and beyond pregnancy itself, which carries its own challenges in the best circumstances, pregnancy with Owen wreaked havoc on me. The constant physical discomfort unique to carrying a baby like him combined with the never-ending worry and life/death news laid waste to me. From 16 weeks on, my energy was directed toward my baby. Researching, talking to specialists, doing everything physically and emotionally in my power to support Owen consumed most of my time. This increased exponentially the further along I got, and at the end of pregnancy, I’m not sure I gave a single thought to my own needs. If you had asked how I felt, I doubt I would have acknowledged that the extra fluid was having any affect on me or that I was devastated with worry. That took energy too, putting up a front that this was okay, that I was ready, that I had everything under control. By the time Owen was born and died, I had lost myself. In the weeks after losing Owen, we were in shock-panic-disaster mode. All at once, I had no energy because of my grief, but I also had all the energy I’d ever had, because my whole body said “something’s very wrong and you need to fix it!” People brought us food and visited us in shifts, and I really don’t have words for how overwhelmingly supported we were by literally everyone, from our friends and family (which, to be honest, I expected because we have awesome friends and family) to our medical providers (wonderful!) to complete strangers (a blessed surprise–we still don’t know who left a bunch of groceries and the kindest letter on our front porch, and people we had never even met participated in our meal train). 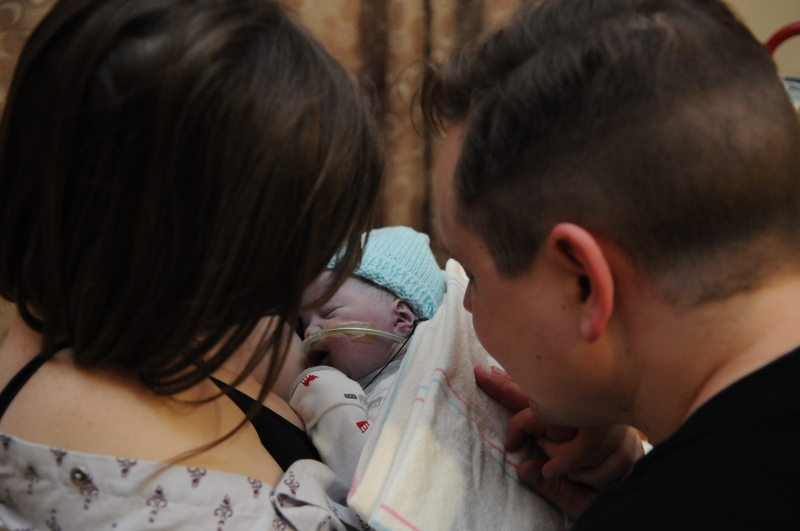 I’ve written previously about how freely I moved in and out of my sadness during those first months without Owen. Similar to pregnancy, I devoted my time and energy to my grieving and making sure that Owen would always be remembered. I was reluctant to give it up. I was up one night with Zach, tearful and lost, and I told him that I wanted to move through this stage, but I was worried that if my days weren’t full of missing Owen that I would forget about him. I wasn’t ready to be anything but Owen’s mother. I wasn’t ready to go back to work or read a book or go for a massage or really anything that might make me feel like me. I only wanted to be Owen’s mom, but I also deeply felt that I was losing the self I am outside of motherhood even more. I didn’t look like myself, with my hair unkempt and my body shaped differently than I was used to. I didn’t feel like myself either; I had no idea what was happening in the world or even with the people around me. I wanted to be (what I saw as) selfish and carve some space out in my life for myself, so I did. Vain as it may be, my lumpy body and extra 30+ pounds bothered me a lot*. I couldn’t fit into my clothes, and I felt awkward all the time. I had tried to get out of the house to make myself feel better, but my maternity clothes were too big, and my pre-baby clothes were too small. All I had were yoga pants and Zach’s t-shirts. I felt ungainly walking around Old Navy in a maternity dress, but the first time I put on jeans that really fit, I felt so good. I could go out to dinner! And the movies! And for walks! I had pants! So that was the first step. Every day after that, I put on clothes that fit and straightened my hair. I put on mascara. I called my boss and told her I was coming back. I put some new books on my kindle. I didn’t forget Owen; I just started taking care of both of us. I went back to work, and it was a setback. Zach had started meditating to deal with his adjustment, so I gave it a shot, too. That was a little too much silent emotion for me, so I did yoga instead. I put my mat on our back patio and thanked the sun and the wind with my movements. It was fitting because I think about Owen when the wind blows gently and the sun shines down on me. I practiced self-compassion. I read books and ate more vegetables and listened to the news and tried to keep track of other peoples’ life events. It worked. I felt a little bit better week by week. I felt more like myself, which was odd because I had sort of forgotten what I was like. It was as if I was meeting an old friend after years of distance. I still remembered Owen as much as I had before. I still loved him. Taking care of myself didn’t negate his memory. *This is specific to me. Some people are perfectly comfortable with their bodies a few weeks post-baby, and that is totally fine. But I wasn’t, I’m not, and I probably won’t be until I can fit back into my pre-pregnancy jeans. Maybe if I had my baby, I’d feel differently. I don’t have my baby, so I think I’m entitled to my jeans. I’ve been writing Owen’s story. It has been slow-going because there’s grief to process with each paragraph. Some day I will post the whole thing, but until then, I’d like to share my beautiful boy with the world. 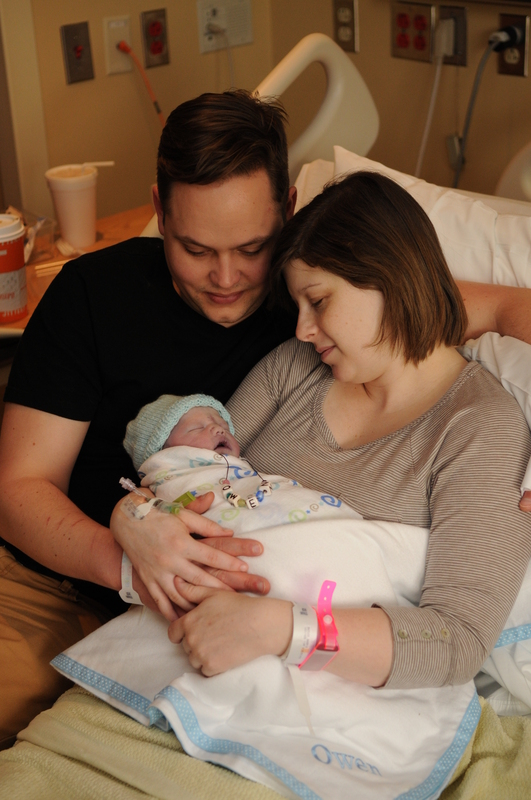 Our pictures of Owen outnumber the minutes of his life, so there’s plenty to share. 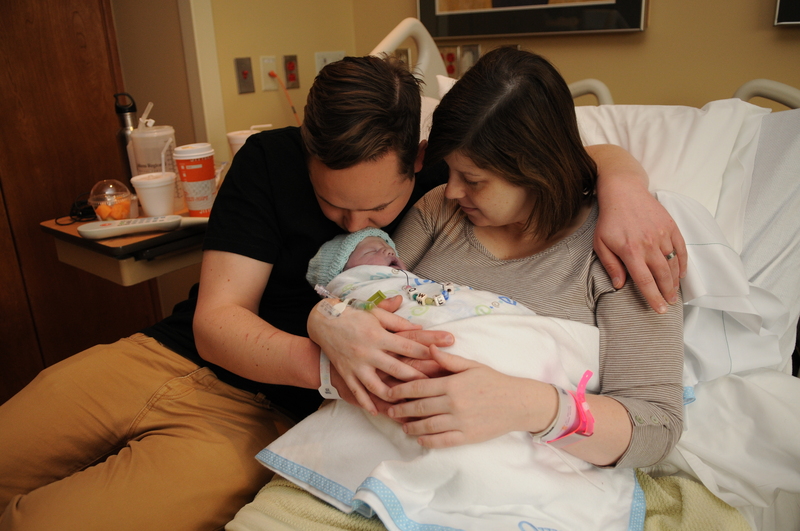 He was never alone, even in the anxiety-filled moments right after his birth. 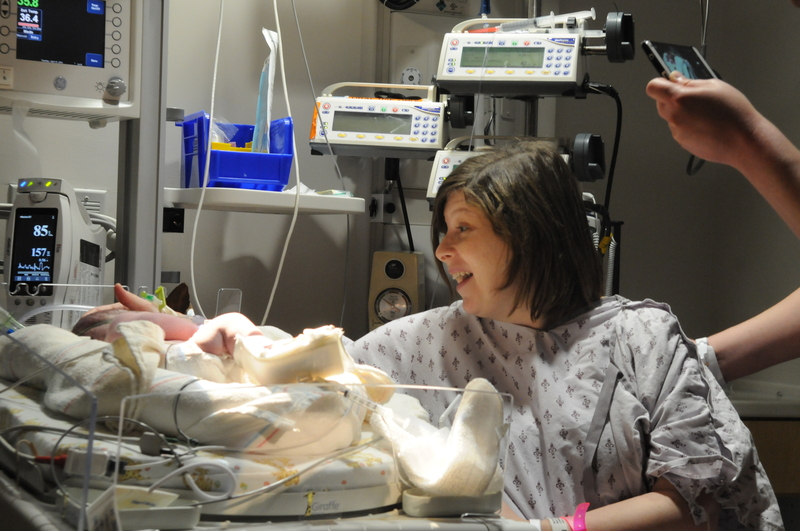 Dr. Khurana, Owen’s neonatologist, was emphatic that Owen breathed easier when Zach was with him right after delivery. 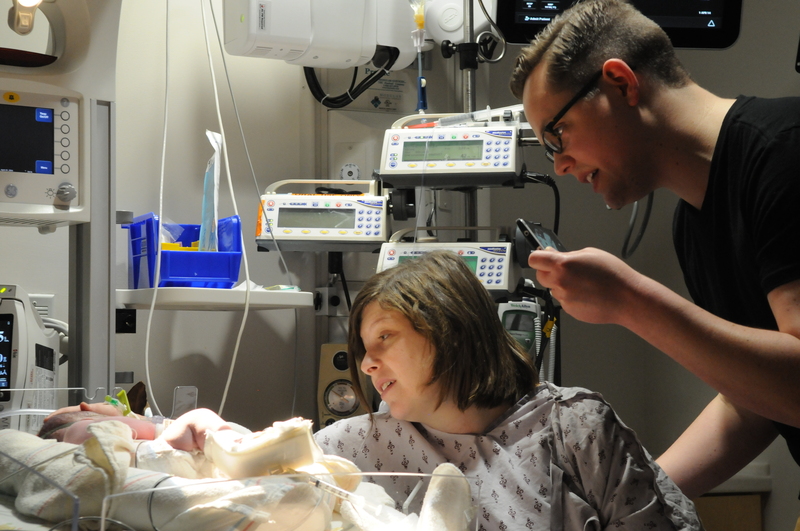 When Zach held his hand, Owen’s oxygen saturation went up, and he responded better to interventions. 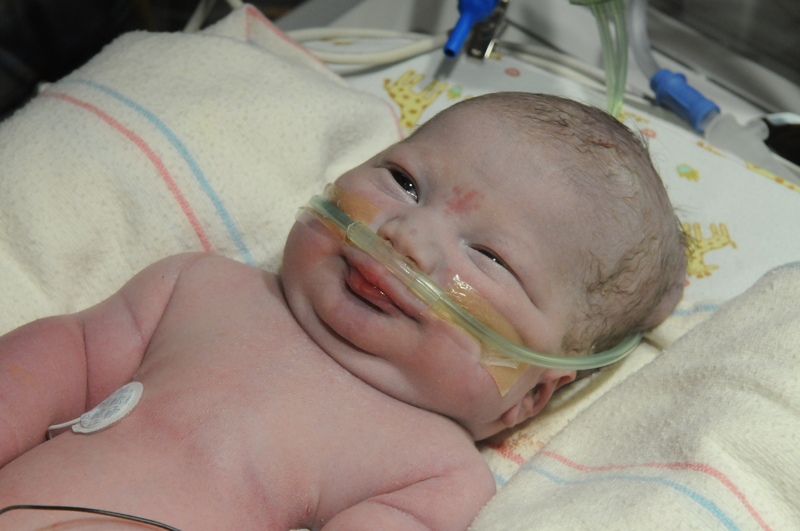 The first time I said Owen’s name, he opened his eyes and looked straight at me. He had the most beautiful brown eyes. For months before Owen was born, I slept with a small blanket. My intention was that if Owen had to leave me, he would have the blanket with my smell for comfort. Zach put it right next to his head when they went to the NICU. 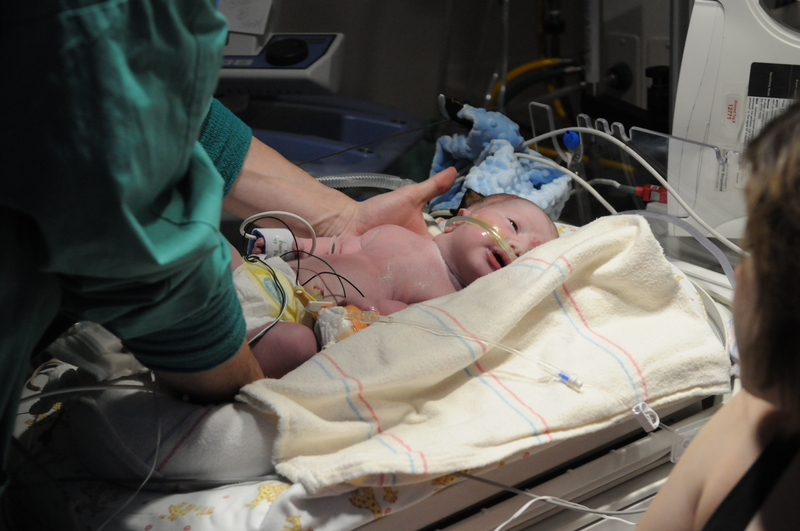 When I first arrived in the NICU, I called out to Owen. He let out a little cry and snuggled his little face into his mama blanket. When Zach and I talked to him, he was so much more restful and content. He knew us. It was wonderful. When we knew that Owen would soon be leaving us, we dressed him in his train jammies and settled him onto my chest. We read a bedtime book, sang Happy Birthday, and thanked him so much for being with us. We told him how proud we were of him for fighting so hard and how glad we were to be his mama and daddy. We loved him, loved him, loved him. That was Owen’s life: beautiful and love-filled, however short. He was a tenacious little baby. He put the whole force of his body behind his cries. He joined our family with a wail and cuddled fiercly. Then, when he was ready to go, he left us with so much peace. I hope, one day far in the future, to meet death with the same grace my son did. I hope my life will be as full of love as his was. I’m constantly surprised that the grief things I thought were unique to me are actually universal. That overwhelming feeling of guilt I had the first time I laughed after Owen died or let an entire afternoon pass without an intentional thought of him? Someone else has been there before. The uncomfortable dilemma of how to answer someone who, during the course of idle chit chat, asks if you have any children? Yep, that’s already happened to a bunch of other broken-hearted mamas. I have a lot of guilt. I know that it’s irrational and (after some really intense conversations with our cardiologist and Dr. Krakow at the International Skeletal Dysplasia Registry) I know that we did absolutely, 100% the best possible thing we could for Owen in letting him go. He was always going to die. From the moment he was conceived to his first little kitten mewl to the time we withdrew interventions, his course had been decided. But I still have guilt, and I’m learning that that’s pretty universal too. I came across this essay at Still Standing a few weeks ago, and as soon as I read the title, I felt it. I am not alone. When I am torturing myself that I didn’t do more for my son, a great swell of other mothers rises beneath me and holds me up. They’ve all been there before. A large number probably even know what it’s like to believe that you could have done the impossible. After Owen had died, when his body was still with us but he was gone, I had the strongest urge to breathe life into him–to just put my mouth to his and breathe. He had been so perfect and robust, aside from his tiny chest. I just knew it would save him. I knew the numbers of his illness: the sizes of the chambers of his heart, the gradient of his pulmonary pressure, the circumference of his chest. But, I couldn’t stop myself from thinking that I could give him life if I just wanted it enough, wished hard enough, loved him more, even though I wanted him intensely, wished for him with all of my being, and loved him ferociously. There’re always the what-ifs in so many things in life, but they are especially present in baby loss. What if I hadn’t taken one dose of ibuprofen, with my provider’s approval, at 8 weeks pregnant? What if I had eaten more protein? What if I had laid on my left side more? I do know that ultimately no amount of left-side lying, protein eating, or medication avoiding could have saved Owen from faulty genetics, from a mutation laced in his cells. I know that I had a nearly perfect pregnancy, health-wise. Still, in the moments when missing him overwhelms every other thought, I wonder, why isn’t he here? There’s no science that answers this pain, and there’s no genetic test that soothes the loss of him, my perfect, beautiful baby son. Today was also my first day in a new position at work. I got a promotion, and I’m now working exclusively with teens and also supervising some other allied health professionals. It hasn’t escaped my notice that, on my dead baby’s 3 month birthday, I am doing something that I absolutely never would have had he lived. I’m happy about the new job. I love the work, and it’s closer to home. But I wanted to be getting back from maternity leave today, not advancing in my career. Hell, I would’ve been happy to be sitting in a hospital teaching Owen how to eat without a feeding tube today. I’m happy, I am, but what I wouldn’t give to be happy for so many other reasons. I met Zach for lunch (another perk of my new job), and on the way back to my office I started bobbing my head to that happy Pharrell song. If you sat next to me at a red light, I wouldn’t look like a grieving mother. I don’t know what to make of myself in this new (old) life. Sometimes I almost forget. Is that okay to say? Am I really allowed to put it on paper that sometimes I almost forget I had a baby and he died? I will absolutely never, ever forget Owen. But sometimes I forget how sad I am. Sometimes the grief sits so far beneath the surface that I can bob my head like a fool while I’m driving around town.